Moto G6, Moto G6 Play, and Moto G6 Plus are all set to be the Lenovo-owned phone maker’s upcoming mid-range handsets with their launch expected next week. But, latest reports suggest that the Moto G6 series might not be all that Motorola has up its sleeves for the April 19 launch event in Brazil. Moto E5 Plus, successor to last year’s Moto E4 Plus, might also make an appearance at the event. 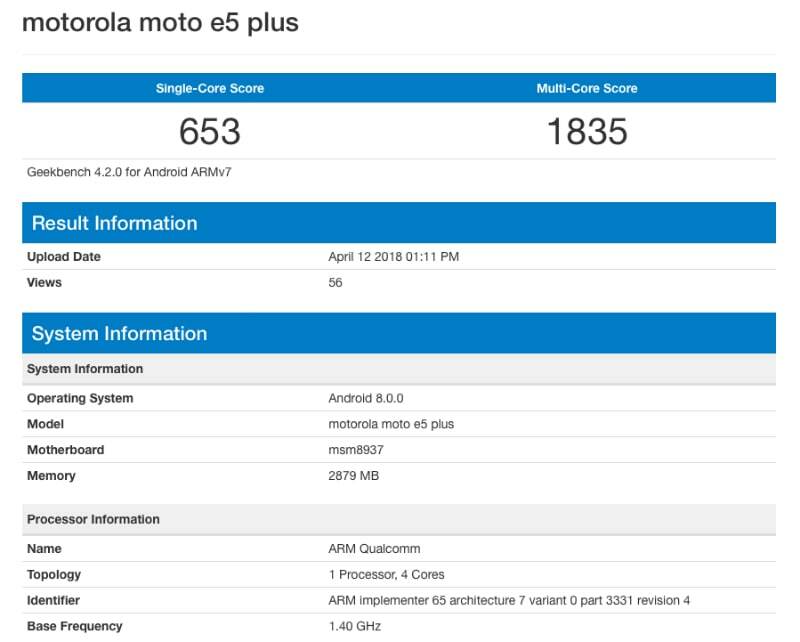 As is customary with most upcoming smartphones, the Moto E5 Plus has been spotted on Geekbench. The listing suggests a single-core score of 653 and a multi-core score of 1835. This is of particular interest considering the Moto G6 Play – expected to be priced slightly higher – has a lower single-core score of 472 and multi-core score of 1801. Apart from that, the listing reveals certain specifications of the budget smartphone that include 3GB of RAM, a quad-core Qualcomm Snapdragon 430 SoC (MSM8937) clocked at 1.4GHz, and Android 8.0.0 Oreo. Separately, a tweet by tipster Antri Yatim suggests the Moto E5 Plus will sport an 18:9 display with a “big” battery, and 3D glass design. Previous reports have suggested that the Moto E5 Plus will sport a 5.8-inch HD+ (720×1440 pixels) display, 3GB of RAM, and 64GB of inbuilt storage. The handset might also get a dual rear camera setup with a 16-megapixel primary sensor and an 8-megapixel secondary sensor, coupled with f/1.75 and f/2.0 aperture respectively. As a matter of fact, the entire Moto E5 series will reportedly arrive with dual rear cameras. In terms of connectivity, the Moto E5 Plus is said to have support for digital compass and NFC.